Sometime in the early 1980s, George Jones was the scheduled guest for a taping of my local talk show, Miller & Company. The studio was set up and lit.... our makeup artist was there.... our director and camera crew were ready... I had done my research and was prepared to interview the Possum. Then came a dreaded, though not totally unexpected, call from the front desk. The receptionist had just gotten word that George Jones wouldn't make the show. But there was other news. Merle Haggard was in the lobby. George and Merle had been recording together, and when Merle heard that George wouldn't be able to fulfill his commitment for my little show (for which guests got paid absolutely nothing), he felt a sense of obligation to cover for him. I went from being disappointed and mildly annoyed, to being elated that I was about to, unexpectedly, interview an honest to goodness country genius who wrote and sang about Mama, jail, work, drinking, betrayal, trains, and wandering. I was really wishing I'd had time to do a little research and prepare for Merle, but it turned out it really didn't matter. A man with as many miles traveled and stories to tell as Merle was an easy interview. He had something to say about anything and everything. It was a delightful evening for me, and an interesting, popular episode of the show. Fast forward to 1987. I was working at KCBS in Los Angeles, and did a series of interviews with celebrities and newsmakers for our evening newscast. 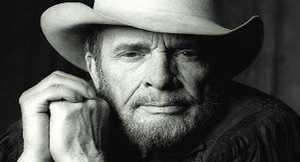 My final interview in that series was with Merle Haggard, who was in LA for a performance. Our crew met with him at his hotel room for the interview. Among the songs we talked about was "That's The Way Love Goes", for which he had won a Grammy for Best Performance by a Male Artist, and which also happened to be one of my favorite Merle Haggard recordings ever. Now, fast forward another six years to 1993, when I was back in Nashville hosting my resurrected Miller & Company Show on The Nashville Network. It was our final show. Apparently our ratings weren't high enough to keep TNN happy, or perhaps they were miffed at me for refusing to follow their baffling guidelines for shows (such as blatantly displaying Fan Club information about each guest)...... but whatever the reason -- after a year and half of production -- we were told this would be our final show. 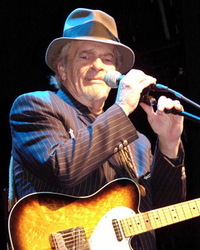 Coincidentally, my final guest was Merle Haggard. The conversation was fun and interesting, and I was pleasantly surprised to see he brought along his guitar. He also brought along his two sons, Noel and Marty, and during one of the commercial breaks, the three of them decided they would perform together. I said, "do whatever you like". Wouldn't you know it.... they chose "That's the Way Love Goes".... Merle and his sons. It was nice way to wrap my final show with TNN. And for whatever it's worth, on that day, Miller & Company was the single highest rated show on TNN.